Sixteen Republican senators are asking their colleagues to pass a budget and confirm President Donald Trump’s nominees before the end of the fiscal year Sept. 30. “It is time to drain the swamp, and we can help do that by keeping the pumps running in August,” Sen. Steve Daines, R-Mont., said at a press conference Tuesday aimed in part at Senate Majority Leader Mitch McConnell, R-Ky.
Daines, Perdue, and others said they want to work to pass a budget and avoid pushing through a last-minute omnibus spending bill as lawmakers did March 23. Trump threatened to veto that spending package before ultimately signing it and vowing not to do it again. 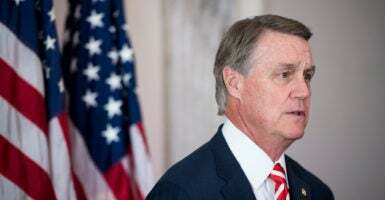 “We want to make sure we fund the government without having to use a continuing resolution or backing into a year-end omnibus,” Perdue said. Sen. Joni Ernst, R-Iowa, said other Americans don’t have the luxury to shirk their work like Congress does. “As far as I know, being a member of Congress is the only occupation where you can neglect some of the most important duties and then take a monthlong vacation right before the deadline,” Ernst said. We received this 2,232-page spending bill a few weeks ago on a Wednesday evening. Then when we found that it was passed by the House before lunch the next day, and passed by the Senate that night, it occurred to many of us that this is not OK, especially when you consider the fact that most of the 435 members of the House and most of the 100 members of the Senate and more importantly, most of the people represented by those members of Congress, were completely kept out of the loop of that process. Daines said the Senate must overcome Democrats’ obstruction to accomplish the will of the American people. Senate Majority Whip John Cornyn, R-Texas, reportedly said McConnell is considering the lawmakers’ request to cancel the August recess.